I didn't take many photos, but they are up on Flickr if you want to have a quick look. 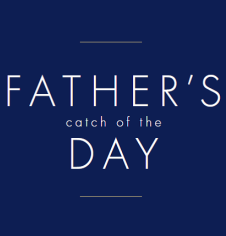 Unlike Mothering Sunday, which is a real Church feast (Laetare Sunday, the fourth Sunday in Lent), Fathers' Day is an invention of the greetings card industry which wanted to cash in. Times change, and no-one sends greetings cards these days, so the field has been left wide open for restaurants to jump in on the act. 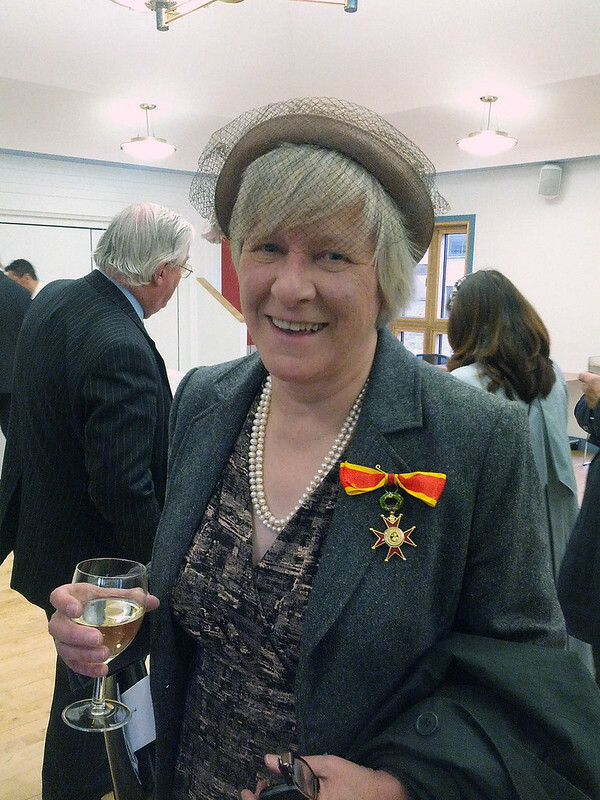 Yesterday I was privileged to be able to attend the Investiture of Joanna Bogle as a Dame of St. Gregory. 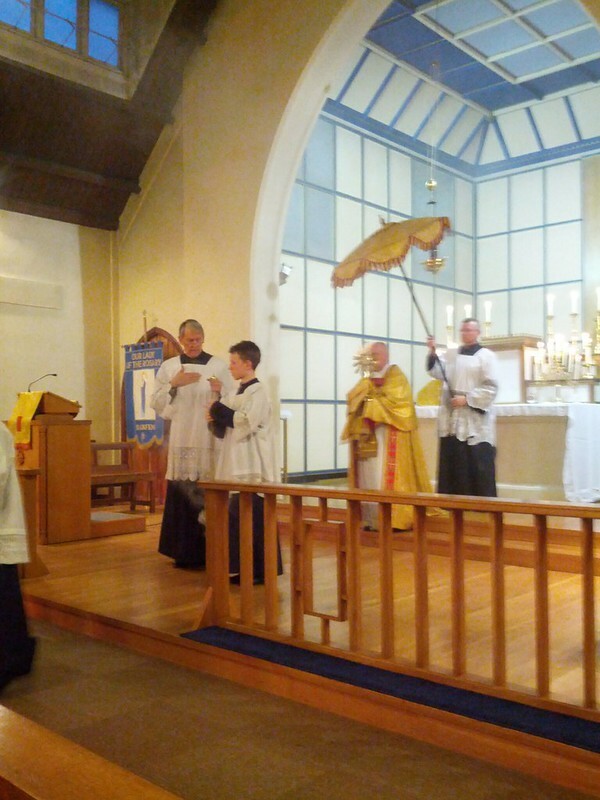 Monsignor Keith Newton, of the Ordinariate of Our Lady of Walsingham, was celebrant for the Mass, and Fr. Stephen Langridge preached the homily. 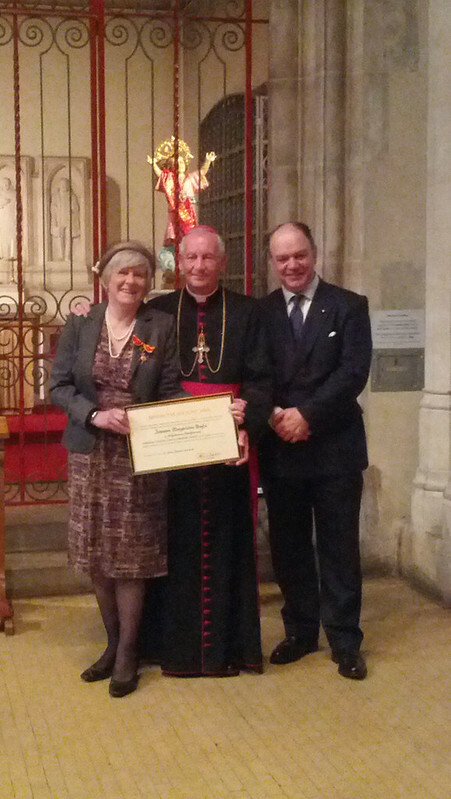 Archbishop Peter Smith had been delayed getting back from a UCM event at Aylesford, but he made it back by the skin of his teeth before Mass ended and so was able to confer the award. Joanna was typically modest in her thank-you speech and said that she considered the award to be a recognition of all the work of many faithful Catholics, but the long list of her activities and achievements in the service of the Church, first by Fr. Langridge during his homily and then by Archbishop Smith at the end of Mass, just underlined what a richly-deserved honour this really was. Joanna has been an indefatigable defender of the Faith for many years, and the Order of St. Gregory is one of the highest honours which can be conferred on a layman. There are a few more photos over at my Flickr page. It was a lovely evening to honour a truly remarkable woman. Many heartfelt congratulations to Dame Joanna, DSG! Auntie Being Economical With The Truth...? 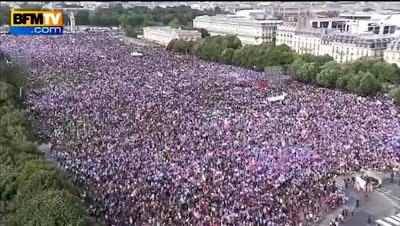 After all, if the police have estimated 150,000 protestors and the organisers have suggested a figure closer to 1 million, then it is obvious that one has to plump for a figure somewhere between the two, no? It would seem that the BBC consider the answer to that one to be a resounding "non" ! Instead they decided to report a far more objective figure of, um, "tens of thousands." In a similar objective vein, the BBC also reported that "thousands of people" gathered in Gloucestershire for the traditional cheese-rolling races on Cooper's Hill. 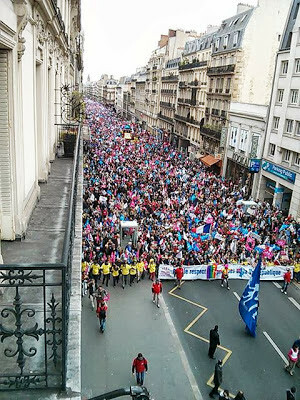 This time the number of spectators was around 3000. I do hope the reporting by the BBC on the British economy doesn't employ the same level of estimation. 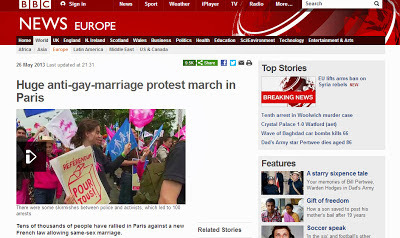 I suppose we ought to be thankful that the Beeb actually reported the Manif Pour Tous march at all. And, to be fair, they did say that it was "huge." The photos are from the Manif Pour Tous Facebook page. Twitch of the mantilla to His Hermeneuticalness for the link.